Here you'll be able to view a selection of New Euro 6 Minibuses all available for sale or lease. If you'd like to know more about minibus leasing just follow the link. Follow this link if it is only quality Used Euro 6 Minibuses you are looking for. Otherwise please feel free to browse our range of New Minibuses and Used Minibuses. Whether you have a requirement for a cleaner vehicle due to low emission zone regulations or local authority licensing requirements, or simply just wanting to do your bit for the environment, the New Euro 6 minibus is currently the standard requirement for minibus emissions. 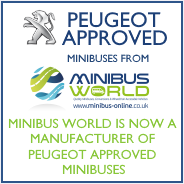 All of our new minibuses are now Euro Six compliant however since Euro 6 has only been a requirement relatively recently, quality used stock is slow to filter through. And if you need any help or assistance just contact us or give us a call and we'll help you find the right minibus for you. Please contact us or call a member of our sales team on 01782 444 289.